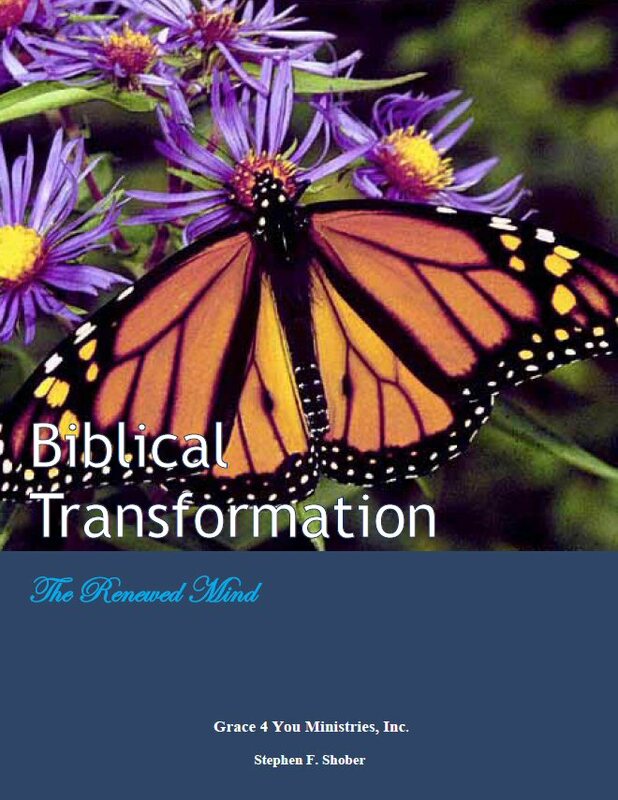 Biblical Transformation: The Renewed Mind | Grace 4 You Ministries, Inc. This 162 page book is written for adults and is intended as a Bible Study Guide for personal and group studies. It has thought provoking questions and gives specific guidelines on how to set up transformation plan(s) that will help a person in the transformation process. Includes practical examples of transformation plans related to: fear, being overweight, negative thinking, and depression. Special attention is given to the Biblical topics of the Judgment Seat of Christ and Christian liberty and freedom. After we believe in Jesus Christ for salvation, Romans 12:1-2 teaches the need to become a transformed person through the renewal of the mind. It may be surprising, but the transformation process will reveal answers to some of life’s most important questions, e.g., “What is God’s will for my life? How can I live a godly life?” This study is designed to help each person gain insight into God’s answers for such questions. Yes, you can know God’s will for your life, and it is learned on a journey with our Lord as He renews your mind. “We thank God for the leading of the Holy Spirit for the grace message that He gives you to teach, believing it will speak to our needs and spirit for the answers and guidance in our lives. God is faithful to meet our needs through His word and the Grace Bible Church family. We are in prayers believing God the possessor of heaven and earth to open you a door of opportunity to come and ignite us through your insightful and practical grace message teachings which we believe will be a great blessing in providing us with great and rich food for our hungry souls, Indeed it will be enriching and growing for our souls in the spiritual walk and Lord’s service.